Onshore and offshore jurisdictions are facing similar battles on the regulatory front like the enactment of the Dodd-Frank Act, FATCA and Fin 48, and the AIFM Directive in Europe. By far and large, FATCA will pose the most immediate and significant challenge for global hedge fund managers and their service providers in 2012. Gathering and reporting the large amounts of information required in order to be compliant will be a massive undertaking. Will hedge fund administrators raise fees? From the fund’s perspective, the main entity responsible for liaising with investors in order to comply with new regulations will be the administrator. Administrators will bear the greatest burden, and funds will need to ensure that this service is covered by the admin agreement. It will be interesting to see whether administrators will look for additional fees to provide this service or perhaps greater limitations on their liability. We may well see some tension around those issues. Investors now require managers to demonstrate they have actually gone through a thorough process when selecting the right service provider. Just because a manager's former firm used a set of service providers that may have perfectly reputable names does not necessarily mean they are the right provider for every fund. Therefore, many of the larger and more established hedge funds have started to look across their whole spectrum of service providers and analyze them - everything from administration to audit and legal and prime brokers, making sure they are getting value for money. In August 2011, the Grand Court of Cayman fined two Directors of the Weavering macro hedge fund $111m each for willful negligence or default. There is not a lot of case law out there where the Directors of a hedge fund have been held accountable for a fund failure. The fact is that you cannot hedge away the risk of poor corporate governance, and investment managers should understand that investors are no longer prepared to accept this risk. What guidance did the Judge provide in the Weavering judgment? How many funds can a Director really serve as an Independent Director? What drives Cayman's continued success as the dominant offshore hedge fund jurisdiction? 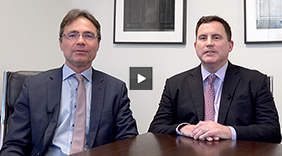 What is the dynamic between offshore fund formations and UCITS in onshore jurisdictions? How does Cayman avoid falling into the infrastructure trap which can affect places like Zug or Geneva? Greg Bennett, Director, The Harbour Trust Co. Ltd.